Amid Scandal, Secret Service Director Julia Pierson Resigns : The Two-Way The efficacy of the Secret Service has come under scrutiny lately, after an armed man ran into the White House. Under pressure from lawmakers, the service's chief resigned. Secret Service Director Julia Pierson testifies before the House Oversight and Government Reform Committee about the White House perimeter breach during a hearing on Tuesday. Pierson stepped down from her position on Wednesday. 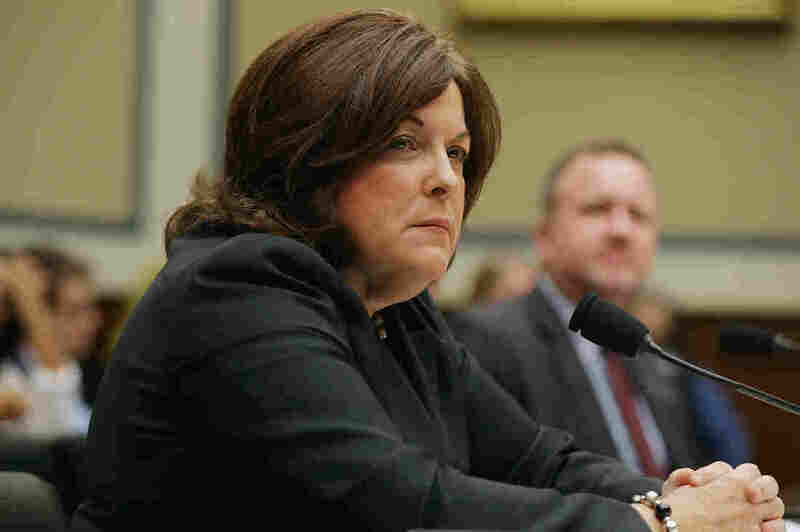 After a series of embarrassing incidents that called into question the efficacy of the Secret Service, Julia Pierson, the service's director, has resigned. Homeland Security Secretary Jeh Johnson said Pierson offered her resignation today and he accepted it. "I salute her 30 years of distinguished service to the Secret Service and the Nation," Johnson said in a statement. Johnson announced that Joseph Clancy, formerly the special agent in charge of the Presidential Protective Division of the Secret Service, will leave the private sector to serve as the agency's acting director. As we've reported, the Secret Service came under scrutiny after a man scaled a fence, then ran past guards into the White House, where he allegedly managed to run through most of the building's main level before being apprehended by an off-duty officer. That happened on Sept. 19. Since then, The Washington Post has published a series of reports about how the Secret Service has fallen short. One report alleged that back in 2011, seven bullets struck the White House and Secret Service agents dismissed it as the backfire "from a nearby construction vehicle." Later the Post reported that when President Obama visited the Centers for Disease Control and Prevention in September, Secret Service agents allowed an armed contractor with a criminal record to ride an elevator with him. Pierson, it's worth noting, took over the Secret Service after the agency found itself in the middle of a prostitution scandal in 2012. Amid that scandal, Mark Sullivan, the agency's director, announced his retirement in February 2013. In his statement, Johnson said he has decided that a "distinguished panel of independent experts" should review the recent events. During his regular press conference, White House press secretary Joshua Earnest said President Obama had talked to Pierson and thanked her for her service. Earnest said Pierson tendered her resignation because "she believed it was in the best interest of the agency." Obama, he said, "concluded new leadership of that agency was required." Pierson's resignation came a day after she was grilled by lawmakers during a congressional hearing. "It's clear that our security plan was not executed properly," Pierson said about the recent security breach. "I take full responsibility. What happened is unacceptable and it will never happen again." In an interview with Bloomberg News, Pierson said resigning was the "noble thing to do," because it would "take pressure off the organization." "Congress has lost confidence in my ability to run the agency," she told the news organization. "The media has made it clear that this is what they expected." She added: "I can be pretty stoic about it, but not really. It's painful to leave as the agency is reeling from a significant security breach."